The extreme age of the universe and its vast number of stars suggest that if the Earth is typical, extraterrestrial life should be common. In an informal discussion in 1950, the physicist Enrico Fermi questioned why, if a multitude of advanced extraterrestrial civilizations exist in the Milky Way galaxy, evidence such as spacecraft or probes are not seen. A more detailed examination of the implications of the topic began with a paper by Michael H. Hart in 1975, and it is sometimes referred to as the Fermi-Hart paradox. Another closely related question is the Great Silence—even if travel is hard, if life is common, why don’t we detect their radio transmissions? 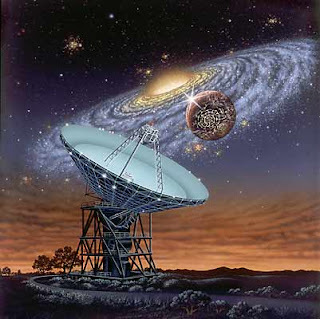 Starting with Hart, a great deal of effort has gone into developing scientific theories about, and possible models of, extraterrestrial life, and the Fermi paradox has become a theoretical reference point in much of this work. The problem has spawned numerous scholarly works addressing it directly, while various questions that relate to it have been addressed in fields as diverse as astronomy, biology, ecology, and philosophy. The emerging field of astrobiology has brought an interdisciplinary approach to the Fermi paradox and the question of extraterrestrial life. Should alien artifacts be discovered, even here on Earth, they may not be recognizable as such. The products of an alien mind and an advanced alien technology might not be perceptible or recognizable as artificial constructs. Exploratory devices in the form of bio-engineered life forms created through synthetic biology would presumably disintegrate after a point, leaving no evidence; an alien information gathering system based on molecular nanotechnology could be all around us at this very moment, completely undetected. Clarke’s third law suggests that an alien civilization well in advance of humanity’s might have means of investigation that are not yet conceivable to human beings. One explanation is that the human civilization is alone in the galaxy. Several theories along these lines have been proposed, explaining why intelligent life might be either very rare, or very short lived. Implications of these hypotheses are examined as The Great Filter. Why Isn’t the Universe Crawling with Intelligent Life? We are used to thinking of intelligent life, as an inevitable consequence of evolution, Hawking emphasized, but it is more likely that evolution is a random process, with intelligence as only one of a large number of possible outcomes. Was the Universe Destroyed by Dark Matter? Did dark matter destroy the universe? You might be looking around at the way things “exist” and thinking “No”, but we’re talking about ancient history. Three hundred million years after the start of the universe, things had finally cooled down enough to form hydrogen atoms out of all the protons and electrons that were zipping around – only to have them all ripped up again around the one billion year mark. Why? Most believe that the first quasars, active galaxies whose central black holes are the cosmic-ray equivalent of a firehose, provided the breakup energy, but some Fermilab scientists have another idea. Dan Hooper and Alexander Belikov posit that invisible, self-destructing dark matter may have blown up every atom in the universe. At least it’s plausible in that if we wanted to ionize an entire universe, we’d want something that sounded that awesome. Dark matter is a candidate for providing ionizing radiation because, if it exists at all, it’s its own antiparticle: if two dark matter particles hit each other they can blow up. 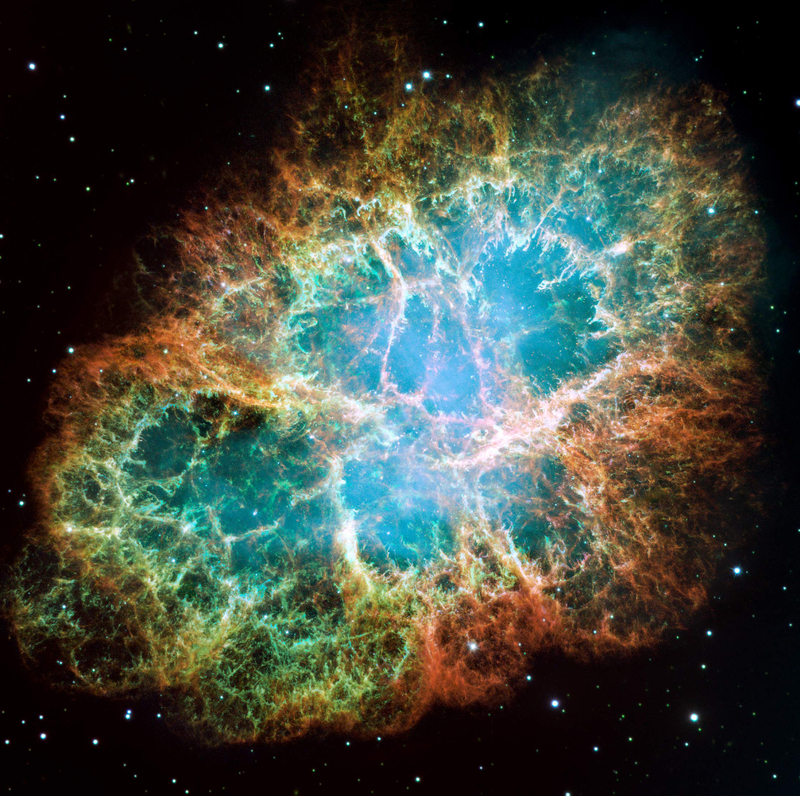 Insane as it sounds, the theory predicts that despite making up most of everything the particles themselves are so tiny, and so terribly fussy about colliding, that they can form huge structures without destroying themselves. Positron emissions which may be an indication of exactly this kind of self-destruction have been observed by the European PAMELA satellite currently orbiting the Earth. As theories go, this one is more awesome than accepted. The quasar hypothesis has wide support, and crediting something we’ve never even seen with reshaping the universe may be going a little far. Then again, that’s what modern cosmology is doing with dark matter anyway, so maybe this idea will fit right in. Auroras, sometimes called the northern and southern (polar) lights or aurorae (singular: aurora), are natural light displays in the sky, usually observed at night, particularly in the polar regions. They typically occur in the ionosphere. They are also referred to as polar auroras. In northern latitudes, the effect is known as the aurora borealis, named after the Roman goddess of dawn, Aurora, and the Greek name for north wind, Boreas by Pierre Gassendi in 1621. The aurora borealis is also called the northern polar lights, as it is only visible in the sky from the Northern Hemisphere, the chance of visibility increasing with proximity to the North Magnetic Pole, which is currently in the arctic islands of northern Canada. Auroras seen near the magnetic pole may be high overhead, but from further away, they illuminate the northern horizon as a greenish glow or sometimes a faint red, as if the sun was rising from an unusual direction. The aurora borealis most often occurs from September to October and from March to April. The northern lights have had a number of names throughout history. 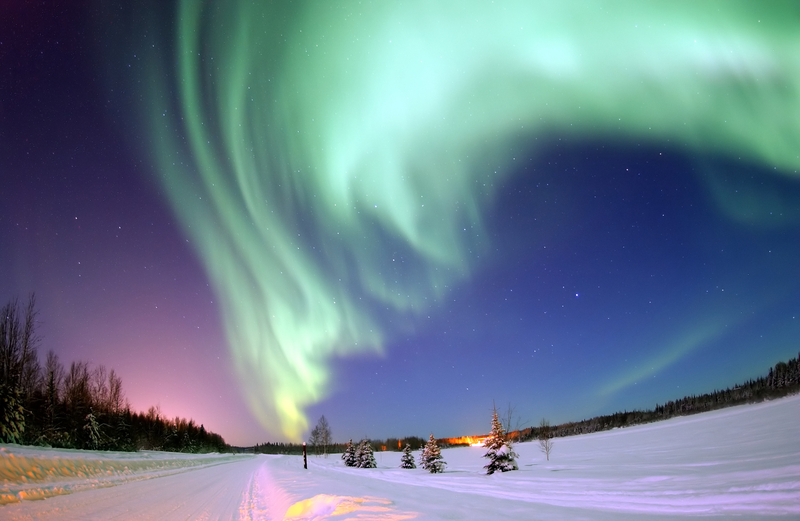 The Cree people call this phenomenon the “Dance of the Spirits.” Auroras can be spotted throughout the world. It is most visible closer to the poles due to the longer periods of darkness and the magnetic field. Benjamin Franklin first brought attention to the “mystery of the Northern Lights.” He theorized the shifting lights to a concentration of electrical charges in the polar regions intensified by the snow and other moisture. The phenomenon of aurora is an interaction between the Earth’s magnetic field and solar wind. Auroras are produced by the collision of charged particles from Earth’s magnetosphere, mostly electrons but also protons and heavier particles, with atoms and molecules of Earth’s upper atmosphere (at altitudes above 80 km (50 miles)). The particles have energies of 1 to 100 keV. They originate from the Sun and arrive at the vicinity of Earth in the relatively low-energy solar wind. When the trapped magnetic field of the solar wind is favorably oriented (principally southwards) it connects with Earth’s magnetic field, and solar particles enter the magnetosphere and are swept to the magnetotail. Further magnetic reconnection accelerates the particles towards Earth. The collisions in the atmosphere electrically excite electrons to take quantum leaps (a mechanism in which the electron’s kinetic energy is converted to visible light); and molecules in the upper atmosphere. The excitation energy can be lost by light emission or collisions. Most auroras are green and red emissions from atomic oxygen. Molecular nitrogen and nitrogen ions produce some low level red (pink) and very high blue/violet auroras. The light blue and green colors are produced by ionic nitrogen and the neutral helium gives off the purple colour whereas neon is responsible for the rare orange flares with the rippled edges. Different gasses interacting with the upper atmosphere will produce different colors, caused by the different compounds of oxygen and nitrogen. The level of solar wind activity from the Sun can also influence the color and intensity of the auroras. The Earth is constantly immersed in the solar wind, a rarefied flow of hot plasma (gas of free electrons and positive ions) emitted by the Sun in all directions, a result of the million-degree heat of the Sun’s outermost layer, the corona. The IMF originates on the Sun, related to the field of sunspots, and its field lines (lines of force) are dragged out by the solar wind. That alone would tend to line them up in the Sun-Earth direction, but the rotation of the Sun skews them (at Earth) by about 45 degrees, so that field lines passing Earth may actually start near the western edge (“limb”) of the visible sun. Earth’s magnetosphere is the space region dominated by its magnetic field. It forms an obstacle in the path of the solar wind, causing it to be diverted around it, at a distance of about 70,000 km (before it reaches that boundary, typically 12,000–15,000 km upstream, a bow shock forms). The width of the magnetospheric obstacle, abreast of Earth, is typically 190,000 km, and on the night side a long “magnetotail” of stretched field lines extends to great distances. When the solar wind is perturbed, it easily transfers energy and material into the magnetosphere. 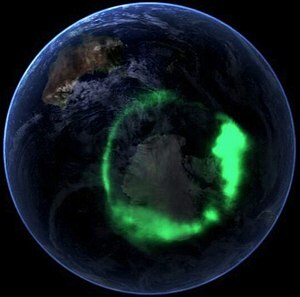 The electrons and ions in the magnetosphere that are thus energized move along the magnetic field lines to the polar regions of the atmosphere. The aurora is a common occurrence in the Poles. It is occasionally seen in temperate latitudes, when a strong magnetic storm temporarily expands the auroral oval. Large magnetic storms are most common during the peak of the eleven-year sunspot cycle or during the three years after that peak. Geomagnetic storms that ignite auroras actually happen more often during the months around the equinoxes. It is not well understood why geomagnetic storms are tied to Earth’s seasons while polar activity is not.